Osso buco is both a wonderful comfort food and a great entertaining dish. It is not hard to make, and better yet the flavors improve when it is made in advance and then reheated. For me it is a go-to entertaining dish when I want to get everything cooked in advance before my guests arrive. This recipe is easily multiplied. Just be sure not to overcrowd your pot. Osso buco translates to "bone with a hole" in Italian, which refers to the marrow hole in the cross-cut veal shank. For many, this nugget of marrow is the prized part of the dish, with some restaurants providing a special spoon to scoop out the rich marrow. 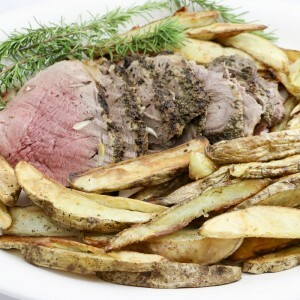 The dish originated in the Piedmont region of Northern Italy, famous for its grass-fed cows. Traditionally osso buco is served with risotto Milanese, a saffron-flavored risotto, and a gremolata garnish, a mixture of finely chopped lemon zest, garlic and parsley. Osso Buco Should Cook With Red Or White Wine? The oldest recipes for osso buco were made with white wine. 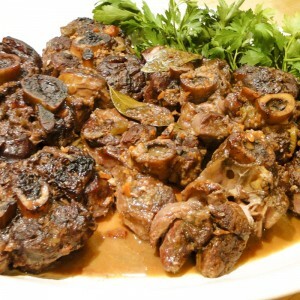 Today you find osso buco recipes with both white and red wine. While osso buco takes very little time to prepare, it gets its fork-tenderness from slow cooking in wine for about an hour and a half. I personally use red wine rather than the traditional white. Use a drinkable full-bodied red wine. Using a wine that you would not enjoy drinking will impart the same disagreeable flavors to your meat. When shopping for your veal, I recommend buying from a butcher and having him cut the shank to your specifications. Have your butcher cut the shank into 1.5" to 2" slices. The diameter of the slices will vary as the shank is smaller at one end and larger at the other. Without sounding sexist, I think of the smaller slices as "lady portions" and the larger slices as "gentlemen portions." This helps me figure out how much to buy. I typically purchase one slice per person and another slice or two for the pot. Don't worry, leftover osso buco will not go to waste. As the osso buco cooks, the meat will literally fall of the bone. If you want a more elegant presentation, ask your butcher to tie the medallions onto the bone. Or you can use kitchen string to secure the meat to the bone. I generally don't bother with this, it is more a personal preference. Browning the meat is the key to a great osso buco. As Mario Batali says "carefully and comprehensively brown the pieces to a deep golden brown." 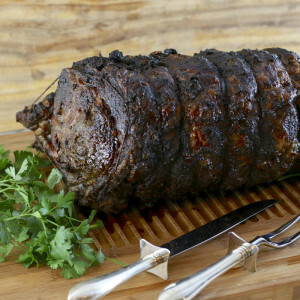 Make sure you do not brown so fast that your meat blackens and burns or your sauce will also taste burnt. Likewise, take the time required to thoroughly brown every side of each veal medallion. The browning creates flavor both in the meat and in the sauce. You will get your best browning if you do not overcrowd the pan while you brown. A cast iron and enamel dutch oven such as a Le Creuset or Staub is the perfect pan for distributing even heat for osso buco. If your pan begins to burn when you are browning your meat, it is not the end of the world. You will want to clean out the burnt stuff before adding the vegetables. Burnt bits will make your sauce taste like burnt bits. Leave the tasty brown bits, they will become part of the sauce when you add the wine. This version of osso buco is adapted from Robert Helstom's Contemporary Italian Favorite Recipes from Kuleto's, a wonderful Northern Italian restaurant just off Union Square in San Francisco. You may also enjoy my Lamb Osso Buco recipe. 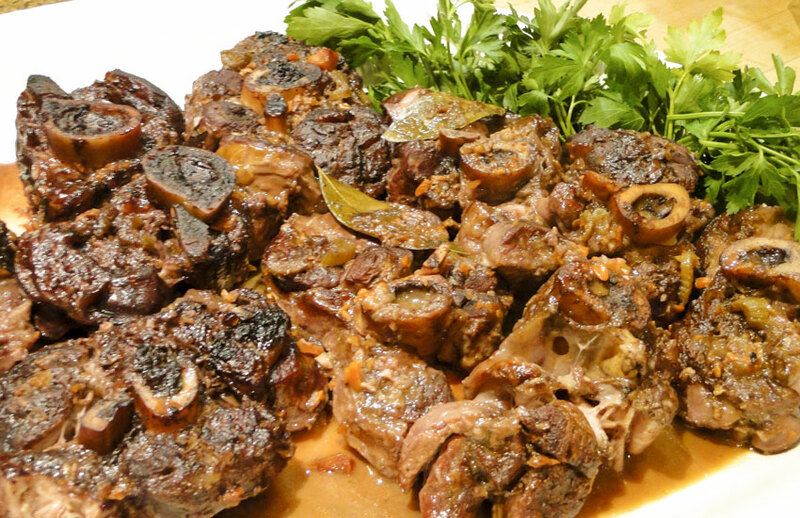 Osso buco is an elegant and easy recipe for entertaining or that special family meal. Brown the shanks, sauté the vegetables and then slow cook in wine for a delicious fall-off-the-bone treat. Heat oven to 400 degrees. Season the meat on all sides with salt and pepper. Dust shanks with flour, coating all sides and then dusting off the excess. Heat an oven-proof pan on medium heat, preferably a cast iron and enamel dutch oven. Pour a few tablespoons of olive oil in the bottom of the pan and carefully brown the shanks, taking care not to burn them. The browning is key to creating flavor in the meat and in the final sauce. Remove shanks from the pan and cover with foil to keep warm. Add more olive oil to the pan and sauté garlic and vegetables until they soften and begin to brown. Add red wine and stir, scraping the bottom of the pan to release the brown bits. Return the shanks to the pan and add stock and bay leaves. Cover the pan and bake until the meat begins to fall off the bone, about 1 1/2 hours. Remove the shanks from the pot and keep warm. Stir the bottom of the pot to release any bits stuck to the bottom. Strain the sauce through a strainer lined with cheese cloth. Discard vegetables and bits that you catch in the strainer. Skim off any fat floating on top of the remaining sauce. You can pour the sauce directly on the veal shanks. Alternatively, if the sauce is thin, you can put it back into the pot and cook it on high to concentrate and thicken. To make the optional gremolata, chop the garlic in a food processor, then add lemon zest and parsley and whirl again. Or chop by hand. Serve shanks with a bit of sauce and pass a bowl of gremolata to garnish. OK – so Kim will probably be aghast when she hears what I did but it was an A plus winner in my home! I substituted Lamb Shanks for Veal and did not strain the veges at the end but served them with the juice. The first words out of my picky eater daughter were ” Ohhhh! 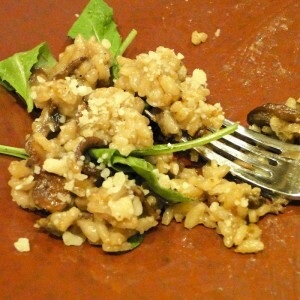 This is a keeper!” It was delicious and so easy to prepare!! Can’t wait to try it with Veal shanks!!!! I am not aghast at all. I am hardly a rule or recipe follower. I love it when cooks go with their gut and do what feels right. That’s where creativity comes in. I have made osso buco many times with lamb shanks. It is delicious and a less expensive than using veal. I have also read you can make turkey osso buco, but I have not tried it. Will have to give it a go. I agree, you don’t always need to strain the veggies. You may want to skim off any excess fat, and then just pour the juice on. I am so glad your family enjoyed it! Cheers Betsy! 400 degrees for an hour and a half? If I set the heat that high, everything in my dutch oven would boil FURIOUSLY! I prefer to cook Osso Buco much more slowly — about 3 hours at 275 degrees. Hi Helen – Osso buco is a very flexible dish. 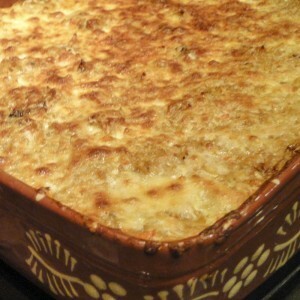 It can be cooked entirely on the stove or started in the stove and finished in the oven. I prefer to finish in the oven because it is more of a hands-off process and I get a consistent moist and tender outcome. I agree that most recipes for Osso Buco call for lower temperatures, usually 325 to 350 degrees, but there is nothing wrong with cooking it a little faster or slower, provided you are using a good Dutch oven that can stand up to the higher heat. I have been cooking Osso Buco at 400 degrees for years, taking my cue from the long time chef at San Francisco’s Kuelto’s, Robert Helstrom. It has always worked out perfectly for me. I think it would be very interesting to do a comparison test to see how cooking faster or slower affects the outcome.